I first told you about NCLA back in November, now here's the polish! 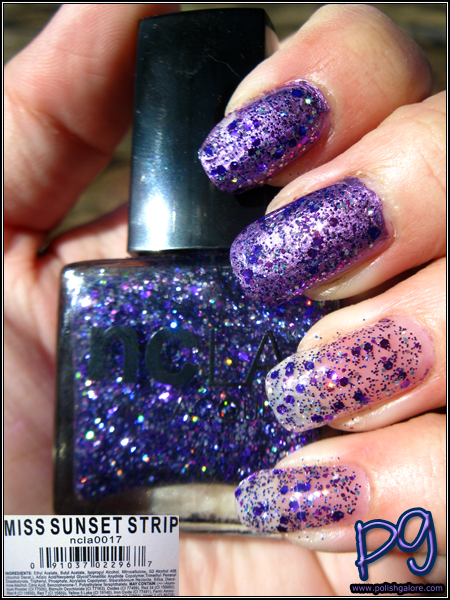 I received a few colors to review, but I couldn't wait to get Miss Sunset Strip on my hands first - literally! Now the square caps on these polishes come off to reveal a smaller round cap but I couldn't get my square cap off this polish for some reason, but know that they do come off. 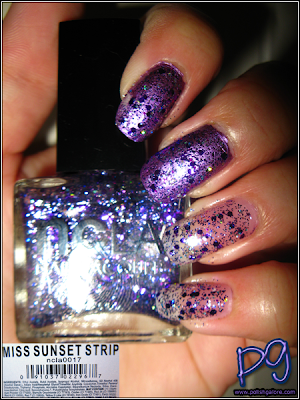 Miss Sunset Strip is a glitter polish with blue and purple microglitter, slightly larger purple and rainbow reflecting glitter, and a clear base. There's so much glitter that it looks like it's a purple base, but sadly, it's not. I used a base coat of Duri Rejuvacote, 3 coats of polish and a top of CND Air Dry. I also used China Glaze Harmony as a base for my index and middle fingers. You can really see the medium purple glitter in the sun but not so much the rainbow reflecting glitter which is too bad because you can see it in the bottle! I definitely need a base under this color for it to really shine. Meanwhile in the shade, you can see more of the rainbow glitter on my ring and pinkie fingers. :] LOVE purple glitter. Finally indoors with the flash - which you pretty much saw already in my NOTD. It looks wrinkly, but it's not! It's such a fun manicure that I wore it twice, oh yes! I can't wait to show you more of NCLA! Right now, they are offering 20% off your order if you enter the code VALENTINE20. Also, they are having their "Light Up The Night" giveaway - three polishes (Bel Air Trophy Wife, LAX Jet Setter and Hollywood & Vine Starlet) given to 3 random winners! Contest open to US & Canada only - ends 9 February at 11:50 p.m. Visit their website page here to enter. NCLA [Website] [Facebook] [Twitter] [Tumblr] is available on the website for $16.00 a bottle and in a variety of stores. I'm wearing Bel-Air Trophy Wife as I read this and it's fabulous. I'm a huge fan of NCLA. Sweeeet! I will have some goodies to show soon. Very pretty!! I've never tried NCLA. Yeah - it's brand new! This is a really pretty glitter! I bet it would look amazing over white! Ooh I didn't even think about over white!